"Old Free Public Library, Tampa, FL" by George Lansing Taylor Jr.
Old Free Public Library, Tampa, Fl. 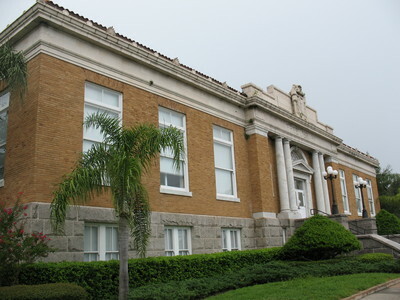 The Old Tampa Free Public Library (also known as the Exceptional Children Education Center) is a historic library in the Tampa Heights neighborhood of Tampa, Florida. Located at 102 E. 7th Avenue. Steel magnate and philanthropist Andrew Carnegie provided funding for more than 3,000 Carnegie libraries in the United States, Canada, and Europe. The library was built using a $50,000 grant from Carnegie. It was designed by Tampa architect Fred J. James and constructed from 1915-1917. It was added to the U.S. National Register of Historic Places on May 16, 1991, NRIS #91000618. It was Tampa's main library until 1968. It includes a T-plan, masonry, brown and yellow brick atop a rusticated granite basement, and is topped by a barrel tile roof. It is now being used for Tampa's Business and Community Services Department. The building was rehabilitated in 1999 by the City of Tampa for public offices. Taylor, George Lansing, Jr.; Lance Taylor; Photographers -- Florida --Jacksonville; Photograph collections -- Florida -- Jacksonville; Old Free Public Library; Exceptional Children Education Center; Carnegie Libraries; Andrew Carnegie; Public library buildings; Hillsborough County (Fl. ); Tampa (Fl. ); Libraries -- Florida -- Tampa.